This help article will provide information about the StringFormat property, a key property of the RadTimeSpanPicker control. 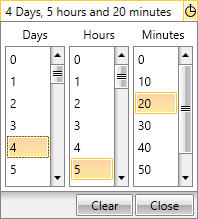 You can use the StringFormat property for formatting the representation of the selected TimeSpan value to any desired format. By using it the current format of the TimeSpan could easily be changed. The following example demonstrates how to set the StringFormat property. You can find detailed inforamation about the supported formats of the TimeSpan here.